Only 2% of B2B enterprise marketers surveyed would describe their content marketing maturity as sophisticated. Eek! One of the biggest opportunities that seems to exist with this group is the ability to integrate content across the organization. QuickTip: The complexities of organizational structure at enterprise brands should not to be taken lightly. While there may be completely separate business units that exist, it’s important to find a way for department heads to collaborate on some level. Even just knowing what another team is working on or has seen success with can help guide the content strategy for the other departments. One of the biggest factors to the success of anything is life is your commitment. So it comes as no surprise that 40% of B2B enterprise marketers would rate the success of their content about the same as the previous year when, 35% of these same marketers would rate themselves as only somewhat committed to content marketing. QuickTip: All of the data points to the fact that content marketing is an essential part of today’s digital marketing landscape. In order to make content marketing a priority, it’s imperative that leadership is on-board with content initiatives. According to the results, only 38% of B2B enterprise marketers have a documented content marketing strategy. That means over 50% of marketers surveyed do not have a strategy to guide their efforts. Document any goals (especially revenue goals) that your marketing department is responsible for. Create a brief synopsis of what has (and hasn’t) worked in the past to help guide your approach. Since it’s impossible to identify all steps right away, select some key areas of focus for the year to help keep your team on track. On average, only 22% of total marketing budgets (not including staff) are spent on content marketing. And a whopping 38% are unsure of the total percentage spent on content efforts. It’s unclear as to where exactly the rest of these funds are allocated, but there is an opportunity to put more behind content marketing. QuickTip: Whether it means implementing new tools to increase effectiveness or working with a content marketing agency, an investment in content is an investment in your customers. Content has the ability to impact every stage of the buying cycle and is a much cheaper alternative to pumping all of your funds in paid tactics. Additionally, content builds authority and credibility over time while other tactics abruptly stop adding value once they’re turned off. 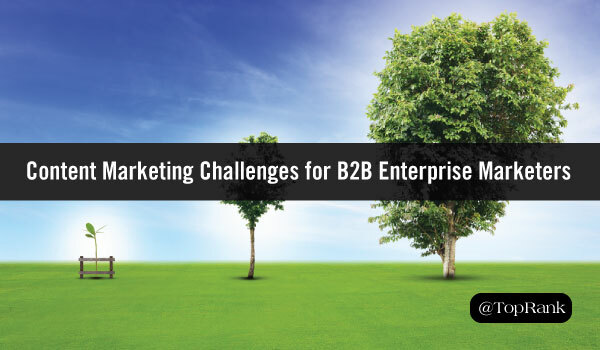 In the full report, you’ll gain additional insights into what is and isn’t working for B2B enterprise content marketers. The future for marketers isn’t bleak, but there is clearly an opportunity to mature, document and invest in content marketing. If you’d like to see all of the results, download the 2017 B2B Enterprise Content Marketing report.